The Jaguars and Vikings defenses are getting all the pub, but don't sleep on this swarming Eagles unit. Well, Sunday was exciting, wasn't it? After two relative duds on Saturday (Atlanta-Philadelphia was close and vaguely exciting, but poorly played and not all that entertaining) with some spotty officiating (as a Patriots fan, I can tell you that the Titans (a) got shafted on a few calls, and (b) still weren't going to win anyway), Sunday was an absolute barn-burner, with a shootout early with some spectacular plays (Pittsburgh scored on two deep bombs, both on 4th down!) and one of the most spectacular finishes in NFL playoff history in the late game (I still have no idea what Marcus Williams was doing on that play). That all leaves us with New England (expected), Jacksonville (unexpected), Minnesota (expected) and Philadelphia (relatively unexpected) left, fighting for two spots in the Super Bowl. Our favorites are (understandably) New England and Minnesota, but just last week we saw Jacksonville pull off a big upset and we saw Philadelphia grind out an ugly, low-scoring game. Both of those things happening again are certainly within the realm of possibility. As far as storylines go, Patriots-Vikings probably gives us the most interesting narrative. They're the league's two best teams, it's the best offense against the best defense, it's the Patriots looking to repeat against a Minnesota team playing on home turf. There's a lot to love there. The worst is definitely Jacksonville and Philadelphia. Joe and Jeremy have each watched every Super Bowl since they've been old enough to reliably not defecate in their own pants, and they might not even bother tuning in for that one. Jacksonville-Minnesota is pretty average (it's the league's two best defenses, so there's that), as is New England-Philadelphia (I can't imagine it would be a very competitive game). I'm sure NBC is rooting for the Patriots and Vikings, even though my guess is everyone outside of Boston is tired of seeing the Patriots in the Super Bowl by now. We'll just have to wait and see, I guess. If this seems like a longer list than usual, it's because it is - it's all six New England linebackers that saw snaps on Satruday night against the Titans. The three that saw the most snaps were Van Noy (67 percent of defensive snaps), Flowers (66 percent), and Harrison (45 percent), and while it might seem easy to dismiss the other three because they each played 20 snaps or fewer, keep in mind that Roberts started 14 games this year, and Geneo Grissom was able to come up with two sacks on Tennessee's final drive of the game. All season, the Patriots have used a steady rotation of linebackers, similar to how most teams rotate defensive lineman. Part has been out of necessity - they don't have a do-it-all linebacker than can play every snap (or, I should say, they don't have one healthy - Donta Hightower filled that role early in the year before tearing a pectoral). What they do have, however, is a number of linebackers that can fill a specific role. Most of us by now are well-versed in Bill Belichick's mantra of "Do Your Job." This specific group of linebackers matches that sentiment very well. The key for New England's defense in this game is going to be stopping the run. They have a ton of talent in the secondary, but the game isn't likely to be won or lost in the Patriots' defensive backfield. The Patriots need to win the trenches, which they decidedly did against Tennessee - they held Derrick Henry to just 28 yards on 12 carries a week after he averaged almost seven yards per rush, and they sacked Marcus Mariota eight times in fewer than 50 dropbacks. It might be tougher against Jacksonville, who showed last weekend in Pittsburgh that they can repeatedly gash a poor run defense. New England's solution against Tennessee was to load seven or eight guys in the box and dare the Titans to run (which they did). They also used James Harrison a lot on first and second down, rather surprising, considering most people (myself included) assumed he was brought in to beef up the pass rush on 3rd down. Considering the Patriots shut down Tennessee's ground game and repeatedly got pressure on Mariota, it seems like they pushed the right buttons. If it works again on Sunday, the Patriots could find themselves another easy win. Okay, fine, this isn't really a "hidden" point. We all know that Tom Brady is nigh-unbeatable when he can sit back in the pocket and wait for receivers to get open, but rather pedestrian when opponents are able to get pressure, especially when they're able to pressure him without blitzing. In perhaps their two most infamous playoff losses, the Giants sacked him five times in the 2007 Super Bowl, almost entirely without blitzing, and the Jets sacked him five times in the 2010 Divisional round despite spending most of the game simply rushing three lineman and dropping eight defenders into coverage. Generally speaking, blitzing Brady isn't the solution - you're leaving too many gaps in coverage when you blitz. To beat Brady, you need to get pressure with your standard four-man rush. The numbers bear out that way - ESPN's Bill Barnwell crunched a few of them earlier this week, noting that since 2007, when Brady is sacked once or not at all, the Patriots win 85 percent of their games (13.6 wins per 16 games), 75 percent of their games when he's sacked twice or three times (12 wins per 16), but just 62 percent of games when he's sacked four or more times (just under 10 wins per 16). Sure, they're still a really, really good team even when teams are able to pressure him, but there's a clear decline in performance there. What the Jaguars have working for them is that they fit this bill, almost perfectly. They blitzed less frequently than any other team in football this year and still had the league's second-best adjusted sack rate, per Football Outsiders. Not only that, but they back up their all-world pass rush with an all-world secondary - cornerbacks A.J. Bouye and Jalen Ramsey both made the Pro Bowl roster, and safeties Tashaun Gipson and Barry Church are both Pro Bowl-caliber players themselves. It would be wrong to just look at Jacksonville's quarterback, their 10-6 record, the embarrassing bottom of the AFC (which they feasted on), the touchdown-plus spread, and the Patriots propensity to beat up on teams without Hall of Fame quarterbacks and assume that this will be a cakewalk for New England. The Jaguars fit the profile of just about every team that has upset the Patriots in the playoffs over the last decade, right down to the seemingly overmatched quarterback. It will take a lot of things going right for Jacksonville in order to topple the Patriots, but it always does. The biggest checkmark, however, is to get pressure on Brady, so we'll see what the Jaguars come up with. Jacksonville brings the league's second-best total defense to this fight, and the Jags will certainly hope that unit does a better job than it did last week in Pittsburgh, when it surrendered 42 points and a ton of big plays to Ben Roethlisberger and company. But, was the Jaguar defense really beaten up and bailed out last week by its offense... Well, yes and no. The Jaguars held Pittsburgh to just seven points and forced a pair of turnovers (including a scoop and score) over the first 29:35 of the game. But, after Pittsburgh scored on a fluky bomb to Martavis Bryant on 4th down with just 25 seconds left in the half to cut Jacksonville's lead to 28-14, suddenly the Jaguar D looked human. Roethlisberger would go on to finish the game with 469 yards and five touchdowns against the league's best pass defense, with Pittsburgh scoring touchdowns on four of its six second-half possessions to make it a game. Along the way, Pittsburgh took advantage of Jacksonville's unwillingness to blitz or double-team Antonio Brown, pushing the ball downfield to Brown, Bryant and Le'Veon Bell, after setting those passes up with short passes to tight end Vance McDonald and slot receiver Eli Rogers. Pittsburgh actually had this success in spit of playing into Jacksonville's hand, simply because they had generational talents like Brown and Bell making plays against Jacksonville's incredible secondary, and Roethlisberger checking the ball down against a defense fearing that big play. If you haven't read this fantastic breakdown by Warren Sharp, go read it now. I don't want to steal all of his points, but the gist is that Jacksonville has a defense perfectly built to beat modern offenses, dominating when teams operate with "11" personnel (1 running back, 1 tight end), by locking down the three receivers on the field, and getting after the quarterback with its front four. There are a few reasons for this. Firstly, this is a pass-first grouping that looks to spread the defense out. Good luck with that against the Jaguars, who have speed to burn at every spot on the field. And, even when teams do run out of this personnel grouping, they usually try to take advantage of the extra space their formation affords, stretching runs to the corners or barreling off tackle. As Pittsburgh found out last week, you can't run east to west against this defense. Telvin Smith and his linebacker mates are too fast, and this aggressive secondary rallies to the ball in a hurry. The Steelers learned this lesson on a critical fourth and inches, and through most of the first half when Le'Veon Bell's trademark hesitation in the backfield was shut down. Only when Pittsburgh began using its short passing game as an extension of the running game, and jamming Bell up the middle, did everything else open up. The only other team to score 40+ on Jacksonville this defense was San Francisco on Christmas Eve, and it coincided with the Niners reverting back to their heavy package roots, looking almost like a Jim Harbaugh-coached team with their heavy usage of both 21 (two backs, one tight end) and 12 (one back, two tight end) sets. The 49ers also gave New England some even bigger hints as to how to slice up the Jaguars. Former Patriots backup quarterback Jimmy Garrapolo, who only threw 30 times compared to SF's 35 runs, protected the ball, and undressed the Jags with presnap movements and shifts, forcing the young, aggressive defense to tip its hand too early. Pittsburgh followed suit with the shifts last week, moving McDonald and Rogers around the formation, and eventually finding the right matchup to exploit underneath, but the Steelers didn't figure this out until it was too late. Oh, and the third-most points scored against Jacksonville this year? That would be Tennessee, who scored 37 in an early-season blowout win, on the back of heavy sets and running back Derrick Henry's big afternoon. If I know all this, bet your house that Bill Belichick does as well. Expect the Patriots to take advantage by using heavy sets and running up the middle on early downs, then using a ton of presnap window dressing to find the soft spots in this very speedy defense. I love this Twitter, so I just thought I'd add another #BlakeBortlesFact. Last Sunday, the Jaguars tied the 1984 Dolphins for the most points scored against Pittsburgh in a playoff game. That means that the two offenses to most exploit the Steelers in the postseason were led by record-setting, other-worldly, changing the game Dan Marino at his absolute best and... Blake Bortles. Yep. For my money, I think this game shakes out closer to New England-Tennessee than it does Jacksonville-Pittsburgh. I would expect the Patriots to come into the game with a defensive gameplan similar to the one they used last week, where they load men into the box and trust their talented secondary to survive mostly single coverage against mostly average receivers. Offensively, yes, I would expect Jacksonville's defense to be better equipped to slow down New England's aerial attack than Tennessee was, but New England is likely to attack the Jaguars differently than they did the Titans. The Jaguars, for all of their talent as a pass rushing unit and in the secondary, actually weren't all that great at stopping the run this season. They ranked 26th in opponents' yards per rush, as well as 26th in DVOA against the run. The Patriots, meanwhile, had the 3rd-best ground attack, per Football Outsiders, and Dion Lewis has spent most of this season gashing opponents between the tackles - he was 3rd in the league in yards per carry, second among running backs. Another thing to note is that while Jacksonville was absolutely dominant at taking away a team's No. 1 wide receiver (they were almost twice as effective as the next-best team), they were merely average against tertiary receivers, tight ends, and running backs (ranking 11th against wide receivers No. 3 and 4, 20th against tight ends, and 15th against running backs). This could again be a point of advantage for the Patriots, who (obviously) throw to their tight ends and running backs as much or more than any other team in the league, and don't really depend on a single outside receiver to make plays downfield. Don't get me wrong - this New England team has some very clear weaknesses, and the right team could definitely exploit them. I'm just not sure that Jacksonville is the right team to do it. As much as Jacksonville was a nightmare matchup for the Steelers, I think the Patriots are a terrible matchup for the Jags. The Patriots have a deep stable of backs, a trusted fullback and multiple tight ends who can block and catch, including this one guy named Gronk who isn't too shabby. If you can run downhill against the Jags, feed your tight ends underneath and down the seam, and occasionally take calculated shots against a confident, but fallible secondary, then you have a good chance of lighting them up. That sounds exactly like what New England will do to me, and on the other side of the ball, you have to trust Bill Belichick and Matt Patricia to figure out a way to slow down Jacksonville's ground game, and keep Blake Bortles in the pocket. Most of the talk will focus on Minnesota's defense, but Philadelphia's outfit is almost as good. If Cox and Graham aren't the best players in the league at their respective positions, there pretty damn close, and they just held Atlanta's offense to 10 points and 281 yards of offense. Football Outsiders has Philadelphia's defense ranked 5th overall in the league, 7th against the pass, 3rd against the run, and their biggest strength was stopping opponents' wide receivers, where they ranked 7th against their opponents' usual No. 1 target, and best in the league against the No. 2 target (by a rather sizeable margin, no less). This could be a cause for concern for the Vikings, who targeted their top two wide receivers a disproportionate amount of the time compared to the rest of the league. Cox and Graham will be tasked with putting pressure on Case Keenum. The Saints put almost no pressure on Keenum in the first half, and Keenum picked them apart. In the second half, Keenum rushed into a few throws, and he looked a lot worse. If Graham can get around the edge and hurry Keenum, we could have another low-score grind. On the interior, we know that Cox is among the best in the league, and we know that Minnesota doesn't run the ball all that well. Last week against New Orleans, they managed just 3.27 yards per carry, which combined with Keenum's shaky second half was a big reason New Orleans was able to mount a comeback. If Minnesota can't establish the run and stay ahead of schedule on 1st and 2nd down, Keenum could have trouble converting 3rd-and-long over and over again against this Philadelphia defense. Here's a stat for you - there are eight, formerly nine NFL teams that play their home games indoors. When those teams play outdoors in the playoffs, and the temperature is at or below freezing, their record is 4-24. The good news for Minnesota is that the current forecast for Philadelphia this Sunday is a balmy 40 degrees. The bad news is that, well, it's the northeast in January. Weird stuff happens. It's somewhat of a strange coincidence to think that Minnesota might be at a disadvantage playing in the cold, because, well, Minnesota is pretty cold. You'd think that the stat has more to do with a team like the Falcons or Saints playing at Green Bay or Chicago, or if you ignore domes, a team like the Dolphins playing Foxborough or the Jaguars playing in Pittsburgh (too soon?). But as the numbers bear out, it doesn't seem to make a difference. If you're looking for more good news for Minnesota, it's that anecdotally, they seem to have the kind of team that could survive a game in cold, crappy weather - they run the ball (not that well, but they do run it) and play tough defense. It's not like we're talking about the Kurt Warner Rams playing in Green Bay. Even still, it's something to keep an eye on. Don't forget, Minnesota's quarterback is still Case Keenum, who a few times last week threw balls up for grabs that could have easily been turnovers, and now he's playing outdoors in cold weather against a defense better than the one he faced then. Part of the reason, perhaps the biggest reason, that Philly is hosting this game as the NFC's top seed is the Eagles' absurd efficiency in the red zone. On the year, Philadelphia led the league by scoring touchdowns on 65.5 percent of its trips inside opponents' 20-yard lines. Most of that could be attributed to timely reads and passing by quarterback Carson Wentz, who threw a league-leading 33 touchdowns this season. Now that Nick Foles is taking the snaps with Wentz on the shelf, the Eagles are still roughly the same team between the 20s, producing at roughly the same level on the ground, an only slightly below Wentz levels through the air. Basically, Foles ain't bad, but Wentz was stupid good in the red zone, and Philly is missing that. 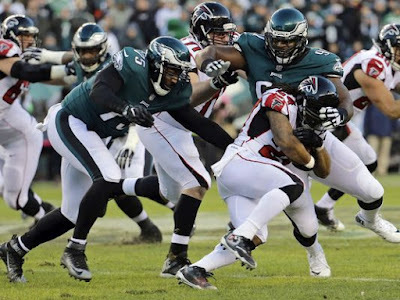 Last week, Philly ventured into the Atlanta red zone three times on nine drives, but only scored one touchdown. Sure, it's a small sample size, but we could have expected a full extra touchdown from a Wentz-led offense. Going against the league's third-best red zone defense, and top total and scoring defense won't make things any easier Sunday vs Minnesota. If Foles can continue protecting the ball like he has been, but can also make that one extra play inside the 20, Philly could be headed to just its third Super Bowl ever. Screw it, I'm going with my gut and saying that the Eagles still aren't as bad as people think they are. Their defense is on par with Minnesota's, they have a better running game, and their shaky quarterback didn't almost blow a two-touchdown lead in the second half last week. Nick Foles looked really bad on the first drive of the game last week, but he actually finished the game remarkably well, all things considered. He had a passer rating north of 100, converted 76 percent of his passes, and as a team the Eagles finished 6-for-13 on third down despite being forced into a few long ones because they were having trouble on the ground. Minnesota's near-collapse in the second half had something to do with Case Keenum's struggles (noted above), but also had a lot to do with Andrew Sendejo and Xavier Rhodes missing significant snaps due to injuries in the second half. Rhodes isn't listed on the injury report, but Sendejo is questionable with a concussion. When both of them were out of the lineup, Drew Brees started torching Minnesota's secondary. Is Nick Foles as good as Drew Brees? No. No he isn't. But if Minnesota's usually stellar secondary suddenly has a few holes in it, he's still a competent quarterback who can take advantage of them. Minnesota's defense doesn't really make big plays. They only forced 19 turnovers, which ranked 23rd in the league. They only sacked opposing quarterbacks 37 times, which was tied for 17th in the league. They just keep everything in front of them, don't allow big plays, and win on third down. That's their gameplan. What we haven't really seen from them much this year is what they look like playing from behind. Should you pick Philadelphia based on an assumption that they'll luck into an early touchdown and Minnesota will have to play from behind? No, of course not. But the later you get into the season, unknown quantities begin to matter more. If this game comes down to defense and special teams, I'd rather have my money on the defense that made big plays (4th-most turnovers forced for the Eagles), and, according to numbers from Football Outsiders, had the more reliable kicker and punter. I think this is going to be a very close, but also probably pretty boring game, but I'll go with the Vikings to win the big moments. In the red zone, I expect Minnesota to hold Philly to field goals, and on the other side, I think Case Keenum has enough playoff moxie to make the big play or two downfield to give his team the edge. Also, as Jeremy said in the intro, we need this magical Minnesota team to complete the journey and become the first team to ever play a Super Bowl in its home stadium. I want to see this defense against New England's offense, and Philadelphia will have plenty of chances to get back to Super Sunday once Wentz is healthy. I'm not sure Minnesota will ever get this blend of defense and improbable quarterback play again. Call this a selfish pick, but I want to see the Vikings in the Super Bowl.